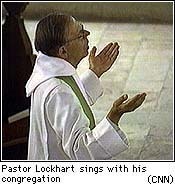 JERUSALEM (CNN) -- The dwindling number of Christians in the Holy Land are facing yet another threat. Militant Jews and Israelis are trying to force members of the religion from seeking converts in the country. Most alarming to Christians is a newly proposed law that would let authorities jail anyone who shares Christian literature. "It could even include the New Testament because, after all, that is certainly a document Jesus would say, 'go out into the world and make disciples,'" Pastor Ray Lockhart of Christ's Church in Jerusalem says. The proposed legislation is aimed at those who possess, print, reproduce, distribute, import, track or publicize information meant as an inducement to religious conversion. "We are a Jewish state," explains Israeli Knesset member and bill co-sponsor Niffim Zilli. "We want to remain a Jewish state." Much of the literature in a small Christian bookstore in Jerusalem would be outlawed by the legislation in its present form. Orthodox Jews already visit the store to harass customers, and there are fears that if the proposed anti-missionary law passes, militants might try to close the shop. "I see this as being quite contrary to human rights, particularly to the right of religious freedom and choice of religion," Lockhart says. Zilli's reply: "Stop your missionary activity in Israel. Stop it!" Christian Evangelical missions give free food to poor Orthodox Jews in Jerusalem, and indigents line up to accept it. "Some of Israel's best friends around the world come from the Bible-believing Christian communities. And if it is seen as though Israel or the government is opposing the people who have been the best friends of Israel, then perhaps support for it could run cold," Clarence Wagner of Bridges for Peace said. The legislation has cleared its first parliamentary hurdle. Prime Minister Benjamin Netanyahu strongly opposes it, but some believe it could pass over his objections, especially if Orthodox Jews decide to engage in muscle-flexing. Rabbi David Rosen of the Anti-Defamation League opposes the bill, but admits that democracy does not have deep roots in Israel. "We are dealing with a society that is very fragile in terms of its own self-confidence and its ability to function within the modern democratic world, and therefore you have to take that into consideration," Rosen says. What is being waged is a cultural clash that opens centuries of old wounds between Jews and Christians. It is a struggle for souls, and the Christians do not have the upper hand.